Remotely identify transceiver type and revision number without having to physically remove an installed transceiver from its slot. Display real-timestatus information about all installed transceivers, including non-operational transceivers. 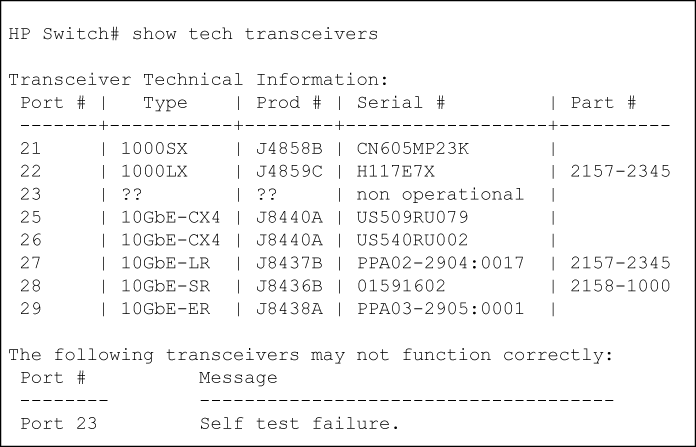 Example of show tech transceivers command shows sample output from the show tech transceivers command. NOTE: Part # column in Example of show tech transceivers command enables you to determine the manufacturer for a specified transceiver and revision number. Port number on which transceiver is installed. Product number — Includes revision letter, such as A, B, or C. If no revision letter follows a product number, this means that no revision is available for the transceiver. Part number — Allows you to determine the manufacturer for a specified transceiver and revision number. For a non-HP switches installed transceiver (see line 23 Example of show tech transceivers command), no transceiver type, product number, or part information is displayed. In the Serial Number field, non-operational is displayed instead of a serial number. This switch only supports revision B and above transceivers. Transceiver type not supported in this port. Transceiver type not supported in this software version. Not an HP Switch Transceiver.